I’ll have an O…Make it a double. If you’ve been to a mall, convention center, fair, or any of numerous other public places in the past decade or two, you’ve undoubtedly encountered an oxygen bar—a counter where people pay for the odd experience of sitting and inhaling scented oxygen for a while. I heard about oxygen bars for the first time in the late 1990s, and my first visit back then, during a trip to Las Vegas, required a taxi ride to the distant suburban outskirts of town. (Nowadays, of course, they’re in every casino.) If you’ve never had the experience, you may be wondering what it’s all about. Most oxygen bars have feature a counter with bar stools. In front of each seat at the bar is a small apparatus with several plastic cylinders filled with colored liquids, and a small control panel with a series of buttons or dials. The friendly bartender (if you can use that term) will explain how the system works. You pay for oxygen based on a fixed period of time—a typical fee is US$10 for 10 minutes or $20 for 20 minutes. Each customer gets a nasal cannula (a thin plastic tube that goes over the ears and has nozzles that fit loosely into each nostril). This is attached to the apparatus with the cylinders, each of which contains scented water. Oxygen is fed through the liquid and then into the cannula; you choose which scent or combination of scents you’d like using the dials—choices may include scents like eucalyptus, lavender, and lemon. Oxygen smells just like ordinary air, and if not for the added aromas, you might never know the difference. Because the nasal cannula doesn’t completely block the nostrils, you end up breathing in about half oxygen and half room air. The first thing you notice when you start a session in an oxygen bar is that you and all your companions look rather silly wearing tubes in your noses. There is a certain etiquette, certain social conventions that apply in a bar; people automatically know how to look at each other and carry on a conversation. But those rules don’t seem to apply at an oxygen bar; it feels unnatural to have a casual conversation with someone when you’re both tethered by the nose to a bubbling machine. What exactly are you supposed to do? Just sit there, close your eyes, and meditate? When I went with a few friends for a 20-minute session, we tried reading the health magazines lying on the counter, but that seemed antisocial. For lack of a better strategy, we ordered fruit juice so we could have something in our hands that would allow us to pretend we were in a familiar social setting and thus be able to interact more naturally. When our session ended, we left, taking our disposable nasal cannulas with us as souvenirs. As we walked outside, we compared notes. The general consensus was that we all felt pretty good—clear-headed, alert, content—pretty much the opposite of the way we would have expected to feel had we just left an ordinary bar. The effect was subtle, to be sure, but pleasant. In fairness, it could probably be said that a similarly tonic effect could have been achieved simply by having 20 minutes of breathing in fresh outdoor air. How much of the effect was real and how much was imagined, I can’t say. I think, though, that the mere process of breathing deeply and deliberately for 20 minutes played a large part in making us feel better. It’s relatively inexpensive to purchase or lease the equipment to run an oxygen bar, and particularly for proprietors of existing cafés, juice bars, and similar establishments, adding oxygen equipment is a good way to boost profits. Patrons feel they’re getting something valuable, and many health-conscious customers would rather spend their money on oxygen than alcohol. On the other hand, oxygen bars are coming under attack from a growing number of critics. One criticism is that oxygen can be toxic if inhaled at too high a concentration for an extended period of time, and even more so if one is suffering from certain illnesses such as emphysema. Technically, the U.S. Food and Drug Administration considers oxygen a drug that can be dispensed only by prescription, and while most states do not enforce that rule, it could be argued that oxygen bar operators are unqualified to judge patrons’ medical tolerance for oxygen. Others worry about the solutions used to add scents to the oxygen, wondering if they might in some way damage the lungs. But the biggest criticism is simply the claim that oxygen bar treatments provide no real benefit apart from a placebo effect. Healthy people already have the maximum possible concentration of oxygen in their blood, the argument goes, so adding more cannot possibly have any physiological effect. My own feeling is that while oxygen bars may provide only minor benefits, the criticisms are a bit silly. If someone wants to pay for a few minutes of air with higher-than-normal concentrations of oxygen, whether or not that has any objectively measurable effect, it seems ridiculous to object. One could say that water should never be administered without a prescription because it can lead to drowning if used incorrectly, or that baseball bats should be licensed as deadly weapons. But people don’t say these things, because they defy common sense. Oxygen bars serve up what amounts to a 40 or 50 percent concentration of oxygen for very short periods of time; even the American Lung Association says, “…there is no evidence that oxygen at the low flow levels used in bars can be dangerous to a normal person’s health.” So while oxygen bars should perhaps not make claims of any specific medical benefits, it is certainly hard to dispute that breathing clean air for 20 minutes is better than breathing polluted air for the same period of time. 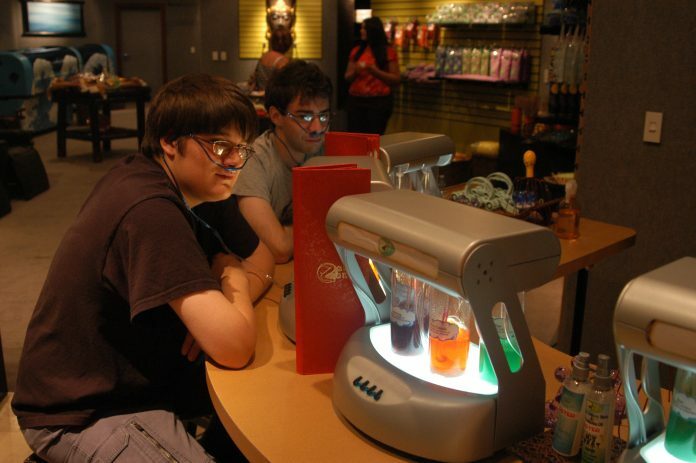 And if a visit to an oxygen bar means time not spent consuming alcohol and breathing smoke, that’s undoubtedly a healthy choice as well. Note: This is an updated version of an article that originally appeared on Interesting Thing of the Day on May 29, 2003, and again in a slightly revised form on December 12, 2004.